5.5 Flue liners shall be surrounded by masonry on all sides but shall not be bonded to the surrounding masonry. The flue liner shall contact the chimney wall only as necessary for support and alignment in order to permit the flue liner to expand and contract freely. The separation of the flue liner from the surrounding concrete or masonry shall not exceed the wall thickness of the flue liner. Where Seismic Reinforcing requires the space between the flue liner and the chimney wall to be grouted solid the flue shall be wrapped with ceramic fiber paper capable of withstanding temperatures of 2100 deg. F to prevent the flue liner from bonding to the chimney walls. You should treat the firebox, throat and smoke chamber in the same way although the expansion is not such a problem since the firebrick and throat are made with fireclay which doesn't expand much and the smoke chamber is not very tall. In the firebox construction we prefer building a solid strong composite firebox of firebrick and back-up brick and then isolating this composite firebox from the masonry shell by means of an air space bond break or insulation if the fireplace is on an exterior wall. First, thank you so much for your website on Rumford Fireplaces - it has been unbelievably helpful! Second, I'm not sure about the clearance that I should have between the smoke chamber/flue lining and the masonary structure. It appears from the instructions that I need to fill in around the firebox, throat, and possibly the smoke chamber with cement/mortar, but it appears that I must leave a space around the flue lining all tha way up. Could you give me a little instruction on what I should do. Again Thank you so much - I'm really excited about building a rumford in my home. You could treat the firebox, throat and smoke chamber in the same way although the expansion is not such a problem since the firebrick and throat are made with fireclay which doesn't expand much and the smoke chamber is not very tall. 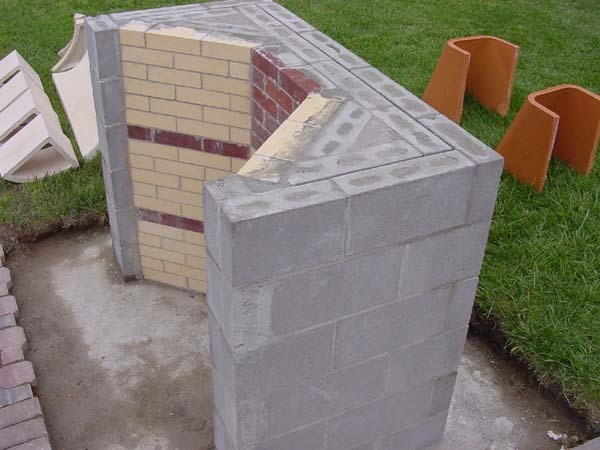 In the firebox construction we prefer building a solid strong composite firebox of firebrick and back-up brick and then isolating this composite firebox from the masonry shell by means of an air space bond break or insulation if the fireplace is on an exterior wall.